Autophagy is the process of degrading cellular components such as lipids, large protein complexes and whole organelles via the lysosomal route, and is used to clear the cell and recycle metabolic building blocks. Altered autophagy is found in various pathological conditions, for example, neurodegenerative diseases, cancer and viral and bacterial infections. 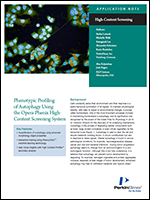 Using an autophagy assay as an example, this study describes the validation of a phenotypic image and data analysis workflow using PerkinElmer’s Harmony® High Content Imaging and Analysis and High Content Profiler™ software. Quantify autophagy using advanced morphology object properties. Generate improved cell classifiers based on combinations of features rather than on single features by applying machine learning methods. Overcome the bottlenecks of multiparametric phenotypic screening.